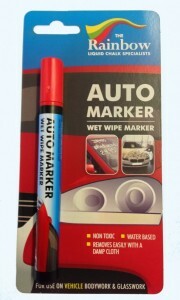 Create spectacular signwriting on non-porous vehicle surfaces, such as paintwork and windscreens, using Rainbow Chalk Auto Marker pens. Resistant to showers yet your designs are easy to update. Just a quick wipe with a wet cloth and you’re ready. 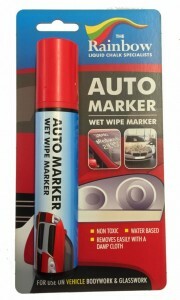 Easy to use the Auto Marker pens are valve activated to inhibit leaks or blobs and prevent waste. Shake well before use to mix the paint and pump the nib for a few seconds to charge, simple! Then you’re ready to design vibrant, colourful signwriting as required.